Kooker is a member of the welcoming team for a family of Syrian refugees that is settling in Lancaster, Pennsylvania. The welcoming team formed, some 24 strong, in Kooker’s Mennonite church. They had answered the call of the Church World Service (CWS), a charity that formed in the aftermath of World War II to help the displaced and the homeless. Let’s not forget: Refugees are ordinary people fleeing extraordinary adversity––they are also the most heavily vetted individuals in our country. To deny the world’s most vulnerable people their last hope of living in safety is to deny our common humanity. This is not who we are. 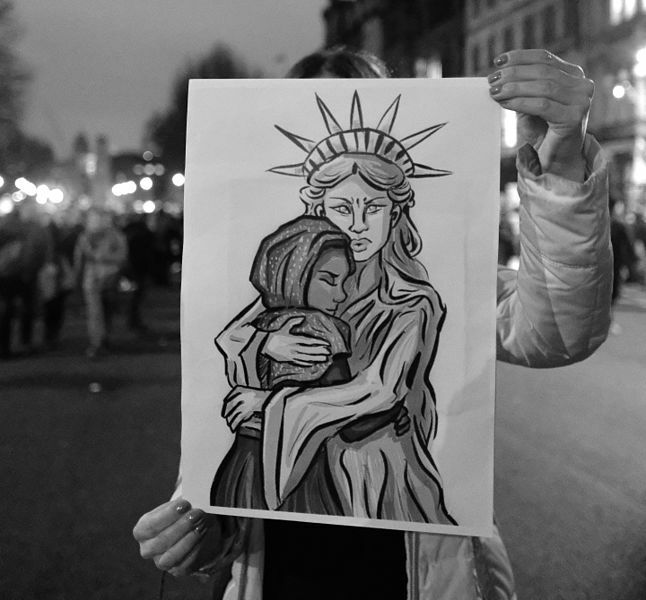 … [W]e will not waver to pursue all options at our disposal to continue serving and protecting refugees, regardless of where they are from or how they pray. We urge the new administration to immediately reverse this announcement … We also urge all Members of Congress … to do everything in their power to see it reversed. The worst humanitarian crisis in recorded history warrants nothing less. The Syrian family, the Almahasnehs, came to the U.S.A. in early January, just before the refugee ban. 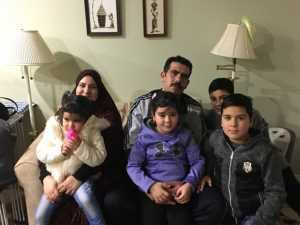 Maher Almahasneh, his wife, Randa, and their four young children, ages 12, 10, 7 and 3, lived in Jordan as urban refugees for three and a half years after they escaped the war in Syria mere days after their youngest daughter was born. They had hidden in underground shelters during bombings and then, even when the skies were clear, the children became too afraid to venture outside. A reporter, Colby Itkowitz, with the leader of the welcoming team, Laura Kanagy, visited them at their apartment. … Almahasneh said he can now imagine a future for his children. He wraps his massive arm around Salam, his 7-year-old daughter, and hugs her close as she recites the ABCs for the group gathered in the living room. He smiles proudly when everyone applauds. She then sings, “Five little monkeys jumping on the bed” — a nursery rhyme Kanagy’s 4-year-old daughter taught her — and everyone laughs. Later the couple will serve large helpings to all who drop in to check on them. Everyone gathers around the small oval kitchen table and Maher loads his guests’ plates with the rice and freshly chopped salad and pickled turnips Randa started soaking almost as soon as they arrived. Once a plate is emptied, he fills it again, ignoring anyone’s protestations that they’re full. The food is so delicious that there’s talk among the welcome team members of helping Randa start a catering company. On Monday evening, 11 members of the welcome team gathered in their church to learn Arabic. It wasn’t a requirement, just something, after weeks of communicating by hand gestures and smiles, that they wanted to do. The team hired Randa to cook them a meal, hoping to give the family a little income while Maher looks for a steady job. They began by learning words for “expensive, cheap; near, far; man, woman; big, small; healthy, sick.” They practiced some basic greetings and the word for “delicious,” so they could properly compliment Randa’s cooking. “It feels like such a hopeless time right now, so to work with people who will stop whatever they’re doing to help … it fills me with hope in the American people really caring about people around the world, caring about the circumstances for their neighbors no matter who they might be,” Kanagy said. And like so many that are resisting the harsh Trump agenda, persons of the welcome team have been calling their members of Congress. They’ve also become advocates, calling their representatives in Congress daily about the ban, and have even set up a meeting with their Republican congressman, Lloyd Smucker, for later this month [February].